The web video above might be a good first step in changing the debate over less government. Obama points out that when Republicans talk about less government, they mean Fewer Teachers, Fewer Firefighters, and Fewer Police Officers. A follow up might also point out that Republican attacks on government also means changes to Social Security and Medicare which are so massive that the programs will no longer exist as we now know them. I would also love to see Obama and other Democrats counter the entire meme that Republicans support smaller government. They do not. Government spending has grown tremendously when under Republican control. Republicans support smaller government when talking about eliminating necessary regulations and cutting back on government programs which most people do want. Republicans support bigger government when it comes to military spending, and when it comes to government intrusion in the private lives of individuals.Restricting access to birth control, telling people who they may marry, and involuntary vaginal probes are hardly the policies of those who believe in limited government. We’ve created 4.3 million jobs over the past 27 months. Over 800,000 just this year alone. The private sector is doing fine. Where we’re seeing problems is with state and local government, often with cuts initiated by governors or mayors who are not getting the kind of help they’re accustomed to from the federal government. Notice how the right wing loves to make noise about comments twisted and taken out of context but is always afraid to respond to the actual positions of Obama and other liberals? Throughout numerous public appearances Obama and Biden have been saying that the economy is improving, but not enough. If you actually pay attention to what Obama is saying, it is clear he does not believe that the private sector is doing fine. What is happening is that there are more private sector jobs being created. 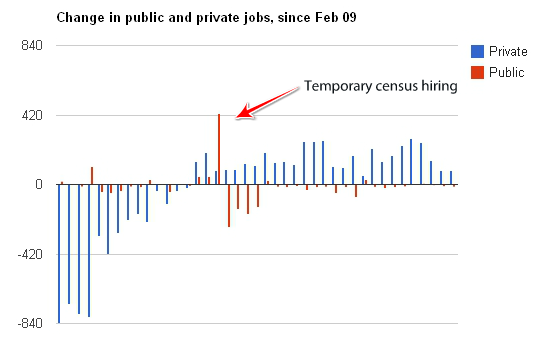 Historically there has generally been greater growth in private sector jobs under Democrats as compared to Republicans. Republicans responding to Obama are correct in saying that the private sector is not fine, while incorrect in attributing the opposite view to Obama. If Republicans agree with Obama that more needs to do to bring about improvement in the private sector, why don’t they respond by passing Obama’s American Jobs Act. Non-partisan economists agreed it would create more jobs, but we know Republicans will not pass anything which would help the economy. While Republicans were elected to Congress with promises of creating jobs, they have preferred to spend their time promoting laws to infringe upon the reproductive rights of women, which have no chance of becoming law, while ignoring the economy.